← Published in April Issue of Dentaltown Magazine! 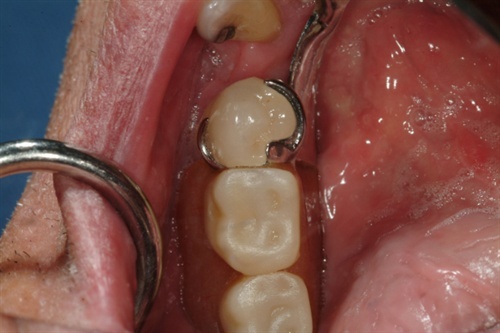 I first posted this “article” on Dentaltown back in 2007. A friend just reminded me about it, so I thought I’d re-post it here. Make the normal impression for the crown. 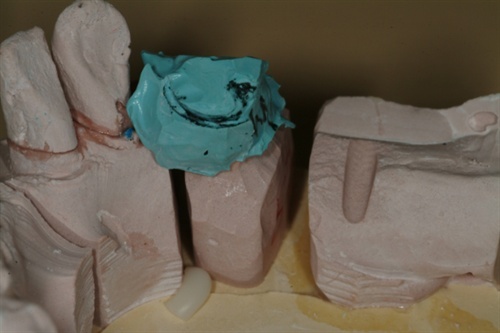 THEN… Squirt a blob of Blu Mousse over the prepped tooth and seat the partial denture. 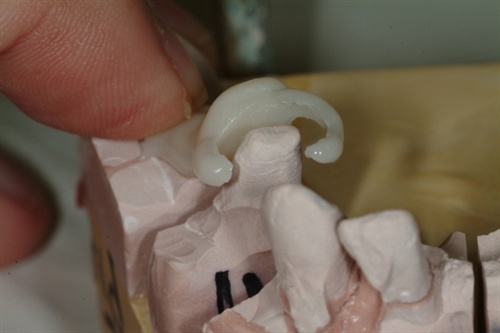 Quickly, with your finger, wipe away the excess Blu Mousse such that you can see the occlusal rest and clasps shining through the Blu Mousse. Let the BM set. 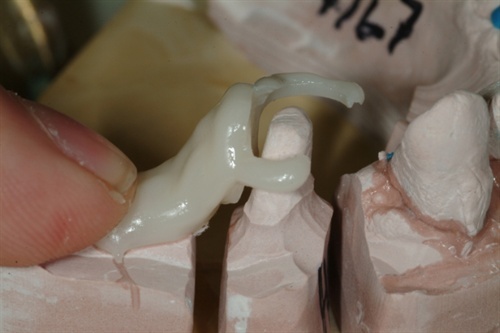 Cut an index groove in the edentulous area of the model. I blocked out the saw cut area with some paper towel. 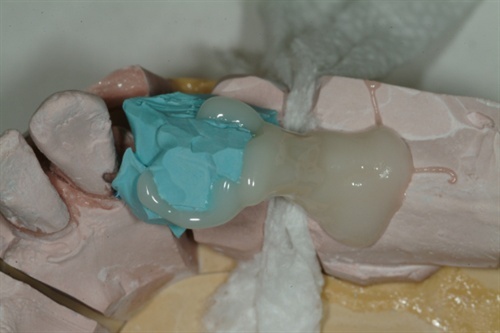 Then I used Luxatemp and flowed a blob over the index previously cut in the edentulous area as our “base.” Then flowed it up the distal guide plane, onto the occlusal rest, and into the clasp areas. Note that it is a bit “over-built,” to strengthen the “clasps.” Luxatemp is a bit brittle. 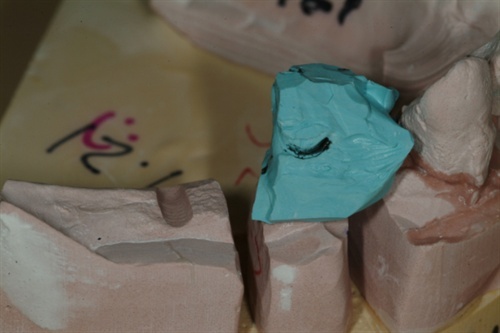 We’re primarily interested in the internal aspect of the clasps and rest for the purposes of building up the crown contours. 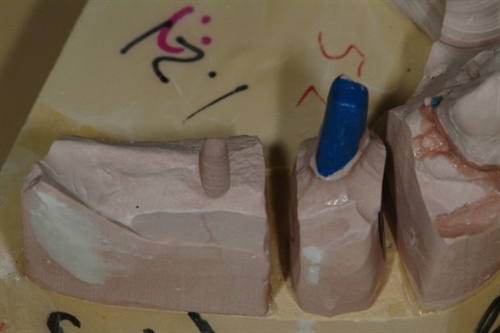 Luxatemp “clasp assembly” with Blu-Mousse removed and reseated on model. I sent these photos to the lab to make sure they understood what to do with this silly piece of plastic. 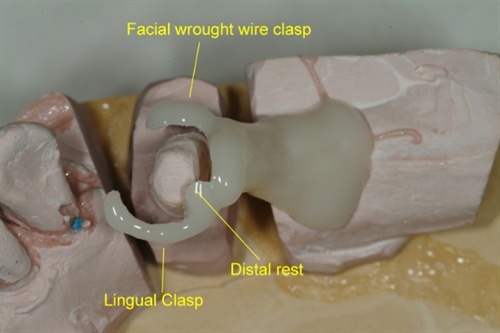 The index groove in the edentulous area makes precise orientation and placement of the “jig” easy. Send case back to lab. Final result. I didn’t touch the crown. I didn’t touch the clasps. This is how it came back from the lab. Not a bad fit, eh? 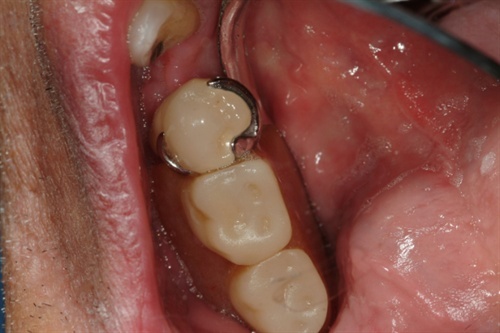 This entry was posted in Clinical Technique, Tips & Tricks and tagged adapt crown to partial, crown, partial denture, RPD. Bookmark the permalink. Lol…being married to a board certified radiologist and nuclear medicine doctor has its advantages. I am not the bread winner and can put everything back into my practice. Great. That crown was quite technically fitted. Instead of using a finger to wipe the excess blue-mousse and expose the clasps and rest, maybe there would be more control if one used a cotton applicator or cotton roll? ?